​A dental crown is like a helmet that goes over the tooth and protects the underlying tooth structure - providing a predictable long term restoration for a weakened teeth. ​a tooth that has lost a cusp or more due to fracture. ​The clinical life span of a crown can be ten years plus, provided the crown is well cared for and you attend your regular dental and hygiene checkups when the margins will be checked in the mouth and on x-ray. ​There are either metal or metal free crowns. ​Metal Crowns have a core of metal onto which a tooth coloured porcelain is fired. These crowns typically are held in place by a slight taper in the preparation design, and a cement. Preparations of these types of crowns mean tooth structure is removed all the way to the gum margin that sometimes results in the strongest part of the tooth been weakened. 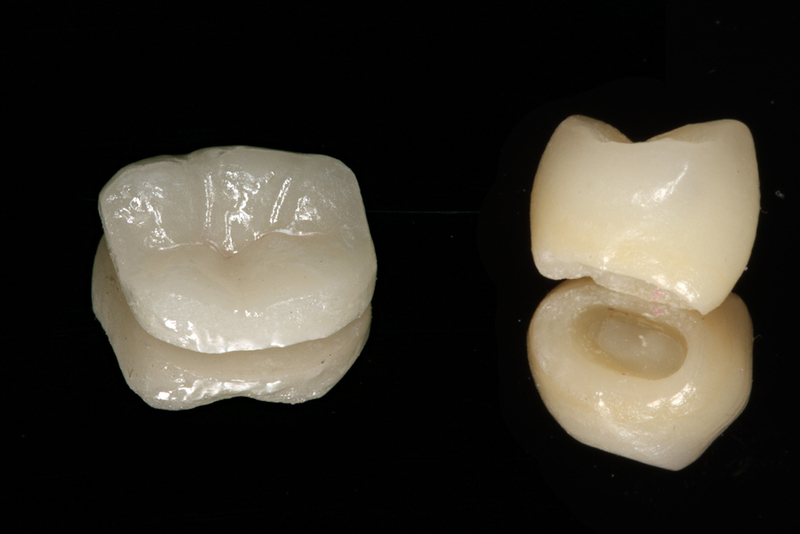 IPS e.max is a ceramic material which combines strength and beauty unlike any other dental restorative. With the new bonding systems available, porcelain can be reliably bonded to the tooth structure, allowing a more conservative approach to preparing the crown without having to cut down to the gum level. These types of crowns are also known as overlays - and your dentist may use these two terms interchangeably - crown/overlay. 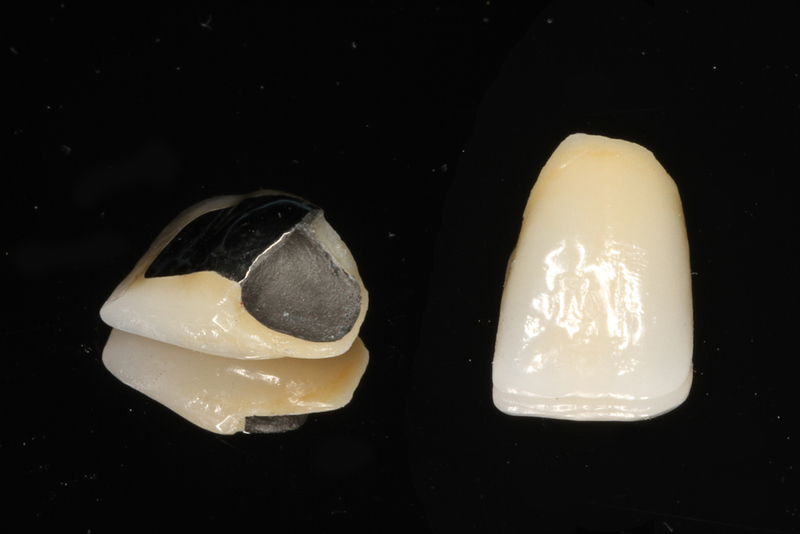 Which Crown Is Best For My Tooth? ​That would depend on the clinical condition of your tooth and your parafunctional habits and would be determined at time of consultation. You are free to choose any restoration of your choice. It is important to consider that patch treatment often ends up costing more in the long run. Research shows that in the majority of cases where a filling has been placed as a 'patch' job instead of a crown, the cost of replacing the fillings a few times over the next few years exceeds the actual cost of placing a crown in the first place. Factor in the extra time spent in the surgery and local anaesthetic endured for the extra visits and it makes more sense to fix the tooth once, instead of 3-4 times thus saving both time and money. ​A bridge is simply a number of crowns fused together that is designed to replace a missing tooth. A 3 unit bridge is the equivalent of three crowns. Veneers are simliar to a Metal Free Crown except only the front and sides of the tooth are prepared. One can liken a veneer to a 'false nail' with the veneer made out of porcelain and bonded to the tooth structure. Can Fractured Teeth That Are Crowned Still Crack Further? Yes! Teeth that have deep fractures and are crowned can still experience further propagation of the fracture resulting in eventual tooth loss. The crown does not guarantee the tooth will not fracture but it does minimise the risk of it doing so in comparison to other restorative procedures available. Teeth that are very heavily fractured and have a doubtful or guarded prognosis would benefit more from implant placement than crowning. Teeth that present with symptoms that are related to nerve damage or nerve death prior to crown placement would always benefit from undertaking the root canal procedure prior to crowning. This would negate the need of having to drill through the top of a brand new crown in order to undertake a root canal on the tooth after crown placement. The problem we have is, teeth that have dodgy nerves are not always symptomatic or painful, and the tooth may be partially dead and yet still give a 'normal' healthy response to testing. We presently have no way of measuring the degree of health of a nerve. We can only determine whether the nerve is dead (non-vital) or alive (vital). In the case of a tooth that needs a crown, if the tooth tests as 'non vital' or having a 'dead nerve' it would be necessary to undertake the root canal procedure first before placing the crown. In cases where the nerve tests 'vital' the crown can be placed, but there is no way of really knowing the real degree of health of the nerve and even though the tooth tested vital, the nerve may be partially dead and the mere act of preparing the tooth for a crown may accelerate the inevitable need for a root canal procedure. In this case symptoms may only present weeks or months later, in which case a hole will need to be drilled through the top of the new crown to gain access to the root canals of the tooth, possibly affecting the integrity of the crown. In these cases the success of the root canal present is assessed, both intraorally and with the use of x-rays. Root canals that are found to be failing, or of questionable prognosis should be redone prior to crown placement. Regardless of whether you are having a crown/bridge/veneer placed the procedure takes place over two visits. 1. At the first visit a general check up of your mouth is undertaken and your tooth/teeth assessed for placement of a crown/bridge/veneer. If everything is favourable , the tooth is prepared under local anaesthetic, and an impression is taken and a temporary crown is placed. The temporary restoration is tooth coloured and hardly noticeable as a temporary. Patients are advised to avoid eating sticky foods like toffees and chewing gum while the temporary is in place and to floss very carefully in order not to dislodge the temporary. The length of the first visit is 1Hr for a single unit and will be longer for more units. Your impressions are then sent off to the dental lab in Auckland, where your crown will be hand made by a NZDC Registered Dental Technician. 2. The second visit is two weeks later, at which point the temporary is removed under local anaesthetic and the fit of the crown is checked. If all is well, the crown will then be bonded and the bite checked. The second visit will be 30 minutes long. Porcelain Veneers(Lab manufactured Porcelain, 2 x 3 hour visits, 2 weeks apart) , view before and after pictures here.